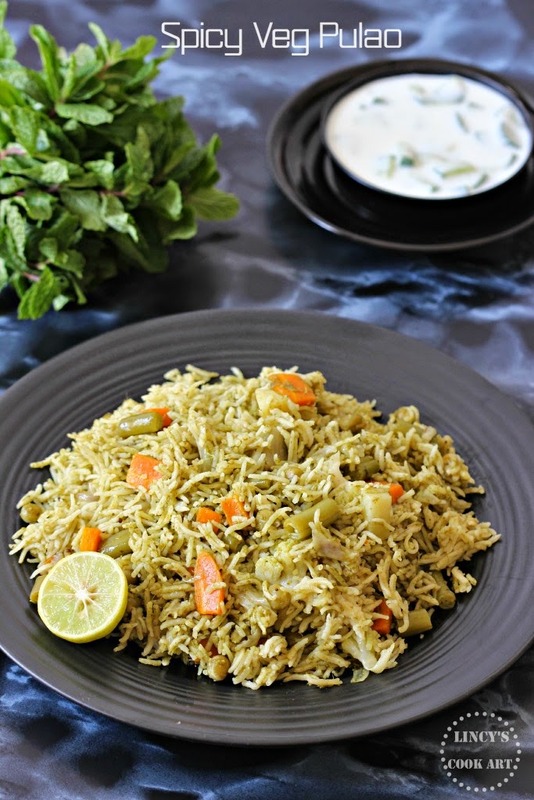 I have earlier shared a simple to prepare less spicy version of Vegetable Pulao. This pulao tastes entirely different from that pulao regarding taste as well as colour. This could be a real treat for week ends or even at the time of unexpected guests arrival. This pulao could be done in three ways one by half cooking the rice and following the same procedure but have to cook the veggies almost well cooked and then add the half cooked rice and mix well. Another method is instead of pressure cooking, follow the procedure and add 2 cups of water for a cup of rice and cook the rice by reduction/ absorption method. Third one is super easy and quick by pressure cooking as i have explained below. Soak the cashew nuts in water for 10-15 minutes. Do it instantly by soaking them for few minutes in boiling hot water. Soak the rice for 10 minutes. Soak the dry peas for 6 hours and half cook them for 10 minutes if you are using dry peas. If you are using fresh or frozen, add them directly. Heat oil and ghee together in a pan and add the onion and fry in that oil till the edges starts to become golden. Grind the items mentioned below to grind as a fine paste as possible. Add the prepared green masala paste and cook in low flame till the oil separates and the raw smell leaves and get the nice aroma. Add extra oil if needed. I have first ground the ginger, garlic, green chillies, cinnamon, cloves and cardamon as a coarse paste and then with that added the roughly chopped coriander and mint leaves and ground that together as fine paste. Chop the veggies almost same size. Add the potatoes and cook for 3-5 minutes in the masala as it takes little longer to cook. Add the carrot, beans, cauliflower, peas and salt. Mix in the masala for a minute well to coat in all the cut veggies. I like the pulao in green colour so i am adding a pinch of turmeric to just lift the green colour. If you like yellow colour add 1/2 teaspoon of turmeric powder. Add the soaked basmathi rice and check for salt. Close with the lid and keep the weight on top and pressure cook the pulao for 2 whistles on medium flame and transfer the pressure cooker immediately on very low flame or keep in sim for 2 minutes like dum to evaporate any excess moisture and switch off the gas. Allow the pressure to dissipate by itself and immediately open the pressure cooker and transfer the pulao to an wide pan to stop the cooking process. Then dizzle lemon juice and mix gently and serve with raita.